In the bowl of a stand mixer or in a large bowl using a hand mixer, whip cream to soft peaks. Add cream cheese and whip until well combined. Add sour cream, brown sugar and Kahlúa and whip until well combined. Stir in food coloring, if using. Set dip aside in the refrigerator for at least 2 days or up to 10 days. 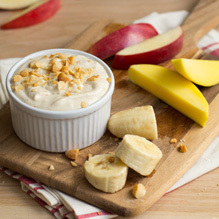 Serve dip topped with toasted nuts, if using, with fruit along side. Makes about 5 cups.